CR39 plastic is higher quality and has better clarity than the Standard CR39 lens. Use this lens for transitions or sun tints. Available with industry leading Anti-Glare coating. Read More Crystal Vision lenses are made by one of the world's largest lens company making top quality lenses. All Crystal Vision lenses are made in the U.S., to exacting specifications, in an Essilor laboratory. This lens is a good choice for corrections up to +/-4.00, and it is available with a variety of options such as Transitions, Tint, Standard Anti-Reflective coating, and the top-quality Crizal Alize and Crizal Avance coatings. Crystal Vision Lenses are top quality lenses at a reasonable price point. The basic CR39 lens includes no-glare, anti-reflective coating in a package price for prescriptions that fall within the stock range. Read More The basic CR39 lens includes no-glare, anti-reflective coating in a package price for prescriptions that fall within the stock range. If your prescription falls outside of the stock range, our Customer Service department will contact you before starting your lens work. Crystal Vision Lenses are top quality lenses at a reasonable price point. Made by Essilor, this lens is our pick for the best quality single vision lens, made by the world's leading eyeglass lens maker. Read More Essilor lenses are made by the world's largest lens company making top quality lenses. All Essilor lenses are made in the U.S., to exacting specifications, in an Essilor laboratory. This lens is a good choice for corrections up to +/-4.00, and it is available with a variety of options such as Transitions, Tint, Standard Anti-Reflective coating, and the top-quality Crizal Alize and Crizal Avance coatings. Eyezen is made by Essilor, the world’s largest maker of eyeglass lenses. Zeiss is the world's pre-eminent brand of precision optics. If you are looking for the best, look no further than Zeiss. The Zeiss CR39 lens is a great choice for corrections up to +/-4.00. Read More Zeiss the world’s pre-eminent brand of precision optics. Founded by Carl Zeiss in 1846, the company has a long history of optical innovation, excellence, and precision workmanship. Zeiss eyeglass lenses are no exception, being the finest eyewear lenses available on the planet. The Zeiss CR39 lens is a good choice for corrections up to +/-4.00, and it is available with a variety of options such as Transitions, Tint, Anti-Reflective coating, and the top-quality Zeiss Duracoat No-Glare coatings. If you are looking for the best, look no further than Zeiss. Higher quality than the Standard Polycarbonate lens, made by one of the world's largest lens maker. Use this lens for transitions or sun tints. Crizal Anti-Reflective coating is available for this lens. Read More The Crystal Vision lens is made in a U.S. lens laboratory by Essilor, the world's largest and best quality lens company. The Crystal Vision lens is a good choice for corrections up to +/-5.00, and it is available with a variety of options such as Transtions, Tint, Standard Anti-Reflective coating, and the top-quality Crizal Alize and Crizal Avance coatings. For more information, follow this link to the Essilor website. Our basic no-glare coating improves visual clarity in all situations, and especially for night driving. Limited to prescriptions in the range -4.00 to +2.50 sphere, and up to -2.00 cylinder. Read More Our basic no-glare coating improves visual clarity in all situations, and especially for night driving. Limited to prescriptions in the range -4.00 to +2.50 sphere, and up to -2.00 cylinder. There are many exclusions for this stock lens. Made by Essilor, this single vision lens is our pick for the best quality single vision lens, made by the world's leading eyeglass lens maker. Read More Essilor lenses are made by the world's largest lens company making top quality lenses. All Essilor lenses are made in the U.S., to exacting specifications, in an Essilor laboratory. This lens is a good choice for corrections up to +/-4.00, and it is available with a variety of options such as Transitions, Tint, Standard Anti-Reflective coating, and the top-quality Crizal Alize and Crizal Avance coatings. Eyezen is made by Essilor, the world’s largest maker of eyeglass lenses. If your RX falls within the "Stock" range & your frame meets the size requirements, you have access to this great lens package, normally a $170 package. Two year anti-scratch warrantee. Read More If your prescription falls inside this range ( -7.00 to +3.00 sphere, and -2.00 to 0.00 cylinder, no prism or slab) and each lenses is no more than 52mm wide, you qualify for this lens package. Crizal lenses have Scotchgard Protector, which reduces nighttime glare from headlights/streetlights for safer driving and fights reflections from computers and overhead lights. Crizal lenses are clearer so wearers can look better, see better and feel better! Follow this link to learn more about Essilor Airwear lenses. Crizal combines excellent smudge resistance with superior dust repellence, thanks to new i-Technology ™, while maintaining glare reduction and scratch resistance excellence. These lenses come with a two year anti-scratch warrantee. If they scratch, you can send them back to us and we will redo them (in the same prescription and frame) at no charge! These lenses are thicker than non stock lenses. Zeiss is the world's pre-eminent brand of precision optics. If you are looking for the best, look no further than Zeiss. The Zeiss Polycarbonate lens is a great choice for corrections up to +/-6.00. Read More The Zeiss polycarbonate a lens that incorporates all of the history and technological perfection inherent in all Zeiss products. This particular lens is available in a range up to +/-6.00 sphere or +/-4.00 cylinder; for higher prescriptions, additional charges may apply. Zeiss is the worldwide leader in excellence in optical lenses. Founded as a workshop for precision mechanics and optics in the German city of Jena in 1846, the Carl Zeiss Group of today is a global leader in the optical and optoelectronic industries. There are currently more than 24,000 employees in the Group. The Group is represented in more than 30 countries by more than 50 sales companies. The company’s production centers are located in Europe, North America, Central America and Asia. Carl Zeiss is headquartered in Oberkochen, Germany. Carl Zeiss AG is fully owned by the Carl-Zeiss-Stiftung (Carl Zeiss Foundation). Carl Zeiss offers innovative solutions for the future-oriented markets of Medical and Research Solutions, Industrial Solutions, Eye Care and Lifestyle Products. The company develops and distributes surgical microscopes, diagnostic systems for ophthalmology, microscopes, lithography optics, industrial measuring technology, eyeglass lenses, planetarium technology, optronic products, camera and cine lenses, as well as binoculars and spotting scopes. This lens has clearer, sharper vision across the entire lens: Wearers experience wider fields of vision and superior sharpness even in low light conditions. Also includes Smart Blue Filter. The Crystal Vision 1.67 high index lens is a good choice within the stock range (-10.00 to +6.00 sphere, and -3.00 to +1.50 cylinder). Read More The Crystal Vision 1.67 high index lens is a good choice within the stock range (-10.00 to +6.00 sphere, and -3.00 to +1.50 cylinder). Crystal Vision Lenses are top quality lenses at a reasonable price point. The Essilor 1.74 Index lens is the thinnest lens on the market today. Anti-reflective coating is automatically included this lens. There may be additional charges for very high prescriptions. Not recommended for rimless frames. Read More Crystal Vision lenses are made in a laboratory by Essilor, the world's largest lens company making top quality lenses. The Crystal Vision 1.74 Index lens is a good choice for high corrections, and it comes with Avance Anti-Reflective coating. Crystal Vision Lenses are top quality lenses at a reasonable price point. Zeiss is the world's pre-eminent brand of precision optics. The Zeiss 1.74 index lens is a great choice for corrections up to +/-12.00. There may be additional charges for very high prescriptions. Read More Zeiss the world’s pre-eminent brand of precision optics. Founded by Carl Zeiss in 1846, the company has a long history of optical innovation, excellence, and precision workmanship. Zeiss eyeglass lenses are no exception, being the finest eyewear lenses available on the planet. The Zeiss 1.74 index lens is a good choice for corrections up to +/-4.00, and it is available with a variety of options such as Transitions, Tint, Anti-Reflective coating, and the top-quality Zeiss Duracoat No-Glare coatings. If you are looking for the best, look no further than Zeiss. Essilor's Eyezen Digital 1.74 is designed for the strongest prescriptions, to make the thinnest and lightest lens available in the world today. Read More Essilor Eyezen 1.74 index lenses are made by the world's largest lens company making top quality lenses. 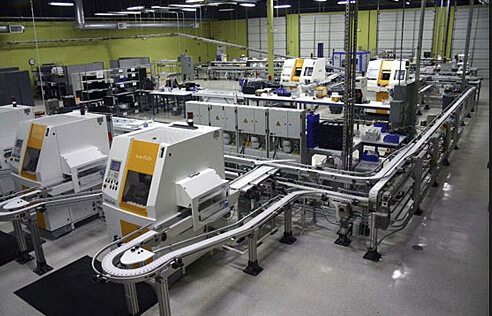 All Essilor lenses are made in the U.S., to exacting specifications, in an Essilor laboratory. This lens is a good choice for corrections up to +/-12.00, and it is available with a variety of options such as Transitions, Tint, Standard Anti-Reflective coating, and the top-quality Crizal Alize and Crizal Avance coatings. For more information, follow this link to the Essilor website. Glass lenses have better optics and scratch resistance compared to plastic lenses.PLEASE ALLOW 2-3 WEEKS FOR PROCESSING GLASS LENSES. There are no warranties available on glass lenses. Read More Crystal Vision glass lenses have much better optics than plastic lenses, and have much better scratch resistance. However, glass lenses are heavier than plastic lenses, and can only be used in fully rimmed eyeglass frames. Please allow two weeks processing time for glass lenses, due to the stringent safety testing requirements. High index glass has 1.60 index, and has the same benefits as regular glass. Good for prescriptions in the +/-3.00 to +/-6.00 sphere range. PLEASE ALLOW 2-3 WEEKS FOR PROCESSING GLASS LENSES. There are no warranties available on glass lenses. Read More High index glass has 1.60 index, and has the same benefits as regular glass. Good for prescriptions in the +/-3.00 to +/-6.00 sphere range. Allow 2 weeks for order processing. 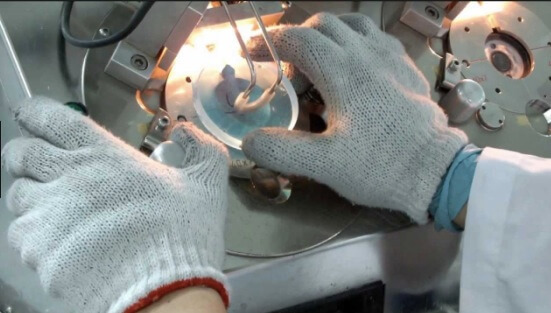 Please allow two weeks processing time for glass lenses, due to the stringent safety testing requirements. A good, basic lens choice for modest corrections. It comes with scratch resistant coating. However, if you want additional coatings you may need to choose a Varilux lens. Read More The Crystal Vision CR39 Progressive lens is a good, basic lens choice for modest corrections. It comes with scratch resistant coating, and you can add a basic anti-reflective coating at a good price. However, if you want additional coatings you may need to choose a Varilux lens. This is a good choice for prescriptions ranging from -5.00 to +3.00 sphere, and -4.00 to +3.00 cylinder, and up to +3.00 add (excluding prism and slab off). Crystal Vision Lenses are top quality lenses at a reasonable price point. The Varilux Comfort has been an excellent lens choice for over a decade. The Comfort is more comfortable to use than the Crystal Vision CR39 Progressive lens. Read More The Varilux Comfort lens has a wider "corridor" than the Crystal Vision lens. The "corridor" is the hourglass-shaped area in the middle of the lens that you can see through. With a wider corridor, you do not have to move your head as much to see objects on the sides. For more information, visit the Varilux website. The Varilux Physio CR39 lens has a wider viewing area, and is therefore more comfortable to use than the Varilux Comfort CR39 Progressive lens. Read More The Varilux Physio lens has a wider "corridor" than the Varilux Comfort lens. The "corridor" is the hourglass-shaped area in the middle of the lens that you can see through. With a wider corridor, you do not have to move your head as much to see objects on the sides. For more information, visit the Varilux website. The Varilux Physio CR39 plastic lens is available in this range: -5.50 to +4.00 sphere, -3.00 to +3.00 cylinder, and up to +3.00 add. However, if your prescription exceeds -/+3.00, you should consider a high index lens in order to minimize lens weight and thickness. In addition, the Physio lens improves contrast sensitivity by helping people in day to day situations, such as driving at night, reading the newspaper and experiencing the vivid colors in a bouquet of flowers. Varilux has developed an innovative design and manufacturing process—W.A.V.E. Technology—which literally corrects progressive vision to deliver the sharpest progressive vision. Sharp vision has two key components: Visual acuity and contrast sensitivity. By dramatically reducing or eliminating higher order aberrations, Varilux Physio delivers an improvement in contrast sensitivity—the ability to see visual details and colors--by up to 30%. Varilux Physio is the only lens proven to increase. The result is an advanced general-purpose lens that delivers unsurpassed progressive performance to all people. Bring yourself even closer to “real world” vision with optimal clarity, depth and dimension with Varilux Physio. The Varilux Physio is made by Essilor, the world's largest maker of high quality eyeglass lenses. The Crystal Vision digital lens is made in the U.S. by Essilor, the world leader in high quality lenses. "Digital" means that the lens is digitally carved on one side. Read More The Crystal Vision digital lens is made in the U.S. by Essilor, the world leader in high quality lenses. "Digital" means that the lens is digitally carved on one side. As a result, you get the most comfortable and easy to wear progressive lens that is available on the market today, at a reasonable price. For more information, visit the Varilux website. This digital lens is the best lens in this category. W3 means that the lens is digitally carved on both the front and back side. As a result, you get the most comfortable and easy to wear progressive lens that is available on the market today. Read More The Varilux Physio W3+ lens is the best lens in this category. The name was change from "Enhanced", and the lens is digitally carved on both the front and back side of the lens. This results in less distortion and a wider "corridor" or viewing area in the middle of the lens. As a result, you get the most comfortable and easy to wear progressive lens that is available on the market today. The Varilux Physio W3+ lens is even more comfortable to wear than the Physio or the Comfort Lens. The recommended prescription range for this lens is -6.00 to +6.00 sphere, and -3.00 to +3.00 cylinder (slab off and prism excluded). The Varilux Physio is made by Essilor, the world's largest maker of high quality eyeglass lenses. The Crystal Vision polycarbonate progressive lens is a great lens at a great price. A good choice for back up frame. Read More The standard polycarbonate Progressive lens is a good, basic lens choice for modest corrections. It comes with scratch resistant coating, and you can add a basic anti-reflective coating at a good price. However, if you want additional coatings you may need to choose a Varilux lens. This is a good choice for prescriptions ranging from -9.00 to +6.00 sphere, and -4.00 to +3.00 cylinder, and up to +3.00 add (excluding prism and slab off). However, if your prescription is over +/-6.00, you should consider a 1.67 index or higher in order to minimize lens weight and thickness. The Varilux Comfort has been an excellent lens choice for over a decade. The Comfort is more comfortable to use than the Standard Polycarbonate Progressive lens. Read More The Varilux Comfort polycarbonate progressive lens has a wider "corridor" than the standard progressive lens, which makes it more comfortable to wear. The "corridor" is the hourglass-shaped area in the middle of the lens that you can see through. With a wider corridor, you do not have to move your head as much to see objects on the sides. This lens works for prescriptions in the range of -9.00 to +6.00 sphere, and -4.00 to +3.00 cylinder, and up to +3.00 add (prism and slab offs excluded). However, if your prescription if higher than -6.00 sphere, you should consider a high index lens in order to minimize lens weight and thickness. Varilux is made by Essilor, the world’s largest maker of eyeglass lenses. The Varilux Physio Polycarbonate lens is more comfortable to use than the Comfort Polycarbonate Progressive lens. Read More The Varilux Physio Polycarbonate lens has a wider "corridor" than the Varilux Comfort lens. The "corridor" is the hourglass-shaped area in the middle of the lens that you can see through. With a wider corridor, you do not have to move your head as much to see objects on the sides which makes it more comfortable. The Varilux Physio CR39 polycarbonate lens is available in this range: -8.00 to +6.00 sphere, -3.00 to +3.00 cylinder, and up to +3.00 add. However, if your prescription exceeds -/+6.00, you should consider a high index 1.67 lens in order to minimize lens weight and thickness. In addition, the Physio lens improves contrast sensitivity by helping people in day to day situations, such as driving at night, reading the newspaper and experiencing the vivid colors in a bouquet of flowers. 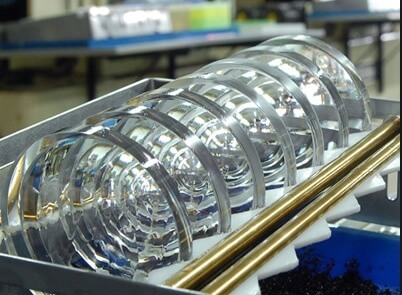 Varilux has developed an innovative design and manufacturing process—W.A.V.E. Technology—which literally corrects progressive vision to deliver the sharpest progressive vision. Sharp vision has two key components: Visual acuity and contrast sensitivity. By dramatically reducing or eliminating higher order aberrations, Varilux Physio delivers an improvement in contrast sensitivity—the ability to see visual details and colors--by up to 30%. Varilux Physio is the only lens proven to increase. The result is an advanced general-purpose lens that delivers unsurpassed progressive performance to all people. Bring yourself even closer to “real world” vision with optimal clarity, depth and dimension with Varilux Physio. The Varilux Physio is made by Essilor, the world's largest maker of high quality eyeglass lenses. The Crystal Vision Digital Progressive lens is a great lens at a great price. This lens is digitally carved on one side to provide improved vision with the thinnest and lightest weight. Read More The Crystal Vision Digital Progressive lens is a great lens at a great price. This lens is digitally carved on one side to provide improved vision with the thinnest and lightest weight. Crystal Vision lenses are made in a U.S. laboratory by Essilor, the world leader in highest quality optical lenses. For more information, visit the Varilux website. The best lens on the market today, the Physio W3 lens is digitally carved on both sides to provide the most comfortable, and widest viewing area possible. Read More The Varilux Physio W3+ Polycarbonate lens is the best lens in this category. The name has been change to W3 from "Enhanced", which means that the lens is digitally carved on both the front and back side of the lens. This results in less distortion and a wider "corridor" or viewing area in the middle of the lens. As a result, you get the most comfortable and easy to wear progressive lens that is available on the market today. The recommended prescription range for this lens is -6.00 to +6.00 sphere, and -3.00 to +3.00 cylinder (slab off and prism excluded). The Varilux Physio W3+ polycarbonate lens is even more comfortable to wear than the Physio or the Comfort Lens. It is comparable to the Definity Digital Lens. In addition, the Physio lens improves contrast sensitivity by helping people in day to day situations as, driving at night, reading the newspaper and experiencing the vivid colors in a bouquet of flowers. Varilux has developed an innovative design and manufacturing process—W.A.V.E. Technology—which literally corrects progressive vision to deliver the sharpest progressive vision. Sharp vision has two key components: Visual acuity and contrast sensitivity. By dramatically reducing or eliminating higher order aberrations, Varilux Physio delivers an improvement in contrast sensitivity—the ability to see visual details and colors--by up to 30%. Varilux Physio is the only lens proven to increase contrast sensitivity in all fields of vision. The Varilux Physio is made by Essilor, the world's largest maker of high quality eyeglass lenses. The Crystal Vision 1.67 high index progressive lens is a good choice within the stock range(-10.00 to +6.00 sphere, and -3.00 to +1.50 cylinder). Read More The Crystal Vision 1.67 high index progressive lens is a good choice within the stock range(-10.00 to +6.00 sphere, and -3.00 to +1.50 cylinder). Crystal Vision Lenses are top quality lenses at a reasonable price point. The Varilux Comfort has been an excellent lens choice for over a decade. Read More The Varilux Comfort high index 1.67 progressive lens has a wider "corridor" than the standard progressive lens, which makes it more comfortable to wear. The "corridor" is the hourglass-shaped area in the middle of the lens that you can see through. With a wider corridor, you do not have to move your head as much to see objects on the sides. This lens works for prescriptions in the range of -10.50 to +6.00 sphere, and -4.00 to +3.00 cylinder, and up to +3.00 add (prism and slab offs excluded). Varilux is made by Essilor, the world’s largest maker of eyeglass lenses. Varilux Physio 1.67 Index is for strong correction, over =/-5.00 sphere. State of the art technology reduces distortion in this ultra high index lens for individuals with high corrections. Read More The Varilux Physio 1.67 Index lens has a wider "corridor" than the Varilux Comfort lens. The "corridor" is the hourglass-shaped area in the middle of the lens that you can see through. With a wider corridor, you do not have to move your head as much to see objects on the sides which makes it more comfortable. The Varilux Physio 1.67 Index lens is available in this range: -9.75 to +6.00 sphere, -3.00 to +3.00 cylinder, and up to +3.00 add. In addition, the Physio lens improves contrast sensitivity by helping people in day to day situations, such as driving at night, reading the newspaper and experiencing the vivid colors in a bouquet of flowers. Varilux has developed an innovative design and manufacturing process—W.A.V.E. Technology—which literally corrects progressive vision to deliver the sharpest progressive vision. Sharp vision has two key components: Visual acuity and contrast sensitivity. By dramatically reducing or eliminating higher order aberrations, Varilux Physio delivers an improvement in contrast sensitivity—the ability to see visual details and colors--by up to 30%. Varilux Physio is the only lens proven to increase. The result is an advanced general-purpose lens that delivers unsurpassed progressive performance to all people. Bring yourself even closer to “real world” vision with optimal clarity, depth and dimension with Varilux Physio. The Varilux Physio is made by Essilor, the world's largest maker of high quality eyeglass lenses. The Crystal Vision digital lens is made in the U.S. by Essilor, the world leader in high quality lenses. "Digital" means that the lens is digitally carved on both the front and back side. Read More The Crystal Vision digital lens is made in the U.S. by Essilor, the world leader in high quality lenses. "Digital" means that the lens is digitally carved on both the front and back side. As a result, you get the most comfortable and easy to wear progressive lens that is available on the market today. This is the thinnest progressive lens on the market today. and it should only be used for the highest prescriptions. Crizal Avance is included in the lens at no extra charge. Read More The Varilux Physio W3+ 1.74 lens is the thinnest progressive lens on the market today. Digitally carved on both the front and back sides, this is the most comfortable lens available for people with very high prescriptions, recommended +/- 6.00 or higher. This lens includes Crizal Avance, the best anti-reflective and super hard coating available on the market today. The Varilux Physio Enhanced 1.74 Index lens is available in this range: -10.00 to +8.00 sphere, -3.00 to +3.00 cylinder, and up to +3.00 add (prism and slab off excluded). The Physio W3+ 1.74 lens improves contrast sensitivity by helping people in day to day situations, such as driving at night, reading the newspaper and experiencing the vivid colors in a bouquet of flowers. Varilux has developed an innovative design and manufacturing process—W.A.V.E. Technology—which literally corrects progressive vision to deliver the sharpest progressive vision. Sharp vision has two key components: Visual acuity and contrast sensitivity. By dramatically reducing or eliminating higher order aberrations, Varilux Physio delivers an improvement in contrast sensitivity—the ability to see visual details and colors--by up to 30%. Varilux Physio is the only lens proven to increase. The result is an advanced general-purpose lens that delivers unsurpassed progressive performance to all people. Bring yourself even closer to “real world” vision with optimal clarity, depth and dimension with Varilux Physio. The Varilux Physio is made by Essilor, the world's largest maker of high quality eyeglass lenses. Glass lenses have better optics and better scratch resistance compared to plastic lenses. ALLOW 2-3 WEEKS FOR PROCESSING GLASS LENSES.There are no warranties available on glass lenses. Read More Crystal Vision glass progressive lenses have all the advantages of glass lenses, which includes better anti-scratch properties and superior visual acuity. However, glass lenses are heavier and take longer - you should allow 2-4 weeks for processing of any glass lens. We recommend the high index glass lenses for prescriptions over +/-3.00 sphere. This lens is available in the following range: -6.00 to +4.00 sphere, -4.00 to +3.00 cylinder, and up to +3.00 add (prism and slab off excluded). Specialty high index progressive glass lens for prescriptions over +/-3.00. Glass lenses have much better optics than plastic lenses. PLEASE ALLOW 2-3 WEEKS FOR PROCESSING GLASS LENSES. There are no warranties available on glass lenses. Read More High Index glass progressive lenses have all the advantages of glass lenses, which includes better anti-scratch properties and superior visual acuity. However, glass lenses are heavier and take longer - you should allow 2-4 weeks for processing of any glass lens. We recommend the high index glass lenses for prescriptions over +/-3.00 sphere. This lens is available in the following range: -6.00 to +4.00 sphere, -4.00 to +3.00 cylinder, and up to +3.00 add (prism and slab off excluded). Zeiss is the world's pre-eminent brand of precision optics. Are you looking for the best quality glass lenses? The Zeiss Glass progressive lens is a great choice for corrections up to +/-10.00. ALLOW 2-3 WEEKS FOR PROCESSING GLASS LENSES. Read More Zeiss the world’s pre-eminent brand of precision optics. Founded by Carl Zeiss in 1846, the company has a long history of optical innovation, excellence, and precision workmanship. Zeiss eyeglass lenses are no exception, being the finest eyewear lenses available on the planet. The Zeiss glass lens is a good choice for corrections up to +/-10.00. However, if you want the top-quality Zeiss Duracoat No-Glare coatings, they are available only on plastic lenses, and are not available for glass lenses. Crystal Vision CR39, flat top 28 bifocal. The reading area has a half moon shape with a "flat top", in the bottom area of the lens. Good for prescriptions up to +/-4.00 sphere. Read More Crystal Vision plastic CR39 lenses for bi-focal vision distance viewing means that the reading area has a half moon shape with a "flat top", in the bottow area of the lens. The standard CR39, flat top 28 bifocal has a reading area that is 28mm wide at the top. This is a good choice for prescriptions up to +/-3.00 sphere; above that, we would recommend a higher index lens in order to reduce the thickness and weight of the lens. This lens is available in the following range: -5.00 to +3.00 sphere, -4.00 to +3.00 cylinder, and up to +3.00 add (prism and slab off excluded). This lens is also available in the Flat Top 35 style, and in the Executive of "Franklin" style. For the Flat Top 35 stye, the reading section is 35mm across thte top. For the Executive style, the line bisects the entire lens from one side to the other. After you have selected this lens, you will see the Flat Top 35 Upgrade option and the Executive Bifocal Upgrade option that you can then select. Crystal Vision Lenses are top quality lenses at a reasonable price point. This CR39 bi-focal has a straight line across the entire length. Also known as "Franklin" style bifocals. Good for prescriptions up to +/-4.00. Crystal Vision polycarbonate, flat top 28 bifocal. The reading area has a half moon shape with a "flat top", in the bottom area of the lens. Good for prescriptions over +/-3.00 sphere. Read More Crystal Vision polycarbonate bifocal lenses for reading and distance vision viewing means that the reading area has a half moon shape with a "flat top", in the bottow area of the lens. The Crystal Vision polycarbonate, flat top 28 bifocal has a reading area that is 28mm wide at the top. This is a good choice for prescriptions over +/-3.00 sphere. This lens is available in the following range: -9.75 to +5.00 sphere, -3.75 to +3.00 cylinder, and up to +3.00 add (prism and slab off excluded). This lens is also available in the Flat Top 35 style. For the Flat Top 35 stye, the reading section is 35mm across thte top. After you have selected this lens, you will see the Flat Top 35 Upgrade option and the Executive Bifocal Upgrade option that you can then select. 1.67 index flat top 28 lined bi-focal. Excellent choice for higher corrections over +/-6.00 sphere. Read More The high index 1.67 bifocal lenses for reading and distance vision viewing means that the reading area has a half moon shape with a "flat top", in the bottow area of the lens. The standard polycarbonate, flat top 28 bifocal has a reading area that is 28mm wide at the top. This is a good choice for prescriptions over +/-6.00 sphere. This lens is available in the following range: -9.75 to +6.00 sphere, - 4.00 to +3.00 cylinder, and up to +3.00 add (prism and slab off excluded). This lens is also available in the Flat Top 35 style. For the Flat Top 35 stye, the reading section is 35mm across thte top. After you have selected this lens, you will see the Flat Top 35 Upgrade option and the Executive Bifocal Upgrade option that you can then select. Glass lenses have much better optics than plastic lenses, and have much better scratch resistance.PLEASE ALLOW 2-3 WEEKS FOR PROCESSING GLASS LENSES. There are no warranties available on glass lenses.There are no warranties available on glass lenses. Read More Bifocal lenses made with the glass lenses material for bi-focal vision distance viewing means that the reading area has a half moon shape with a "flat top", in the bottow area of the lens. The standard glass, flat top 28 bifocal has a reading area that is 28mm wide at the top. This is a good choice for prescriptions up to +/-3.00 sphere; above that, we would recommend a higher index lens in order to reduce the thickness and weight of the lens. This lens is available in the following range: -5.00 to +3.00 sphere, -4.00 to +3.00 cylinder, and up to +3.00 add (prism and slab off excluded). Crystal Vision Lenses are top quality lenses at a reasonable price point, and come with our Perfect Lenses Guarantee. Three viewing areas with this lined tri-focal. Distance, mid-range and reading. Half moon 7*28mm viewing area with two lines. Read More Crystal Vision plastic CR39 lenses for trifocal vision distance viewing means that the reading area has a half moon shape with a "flat top", in the bottom area of the lens. The trifocal lens has three viewing areas, and the magnification area has two viewing areas, one for reading and one for intermediate distance. The standard CR39, flat top 28 trifocal has a reading area that is 28mm wide at the top. This is a good choice for prescriptions up to +/-3.00 sphere; above that, we would recommend a higher index lens in order to reduce the thickness and weight of the lens. This lens is available in the following range: -6.00 to +2.75 sphere, -4.00 to +3.00 cylinder, and up to +3.00 add (prism and slab off excluded). Crystal Vision Lenses are top quality lenses at a reasonable price point. Three viewing area lens with polarization for sunshine glare reduction. Read More Standard plastic CR39 lenses for trifocal vision distance viewing also include tinted Polarization technology, making them great for outdoor activities on the water where there is a lot of glare reduction needed. "Trifocal" means that the reading area has a half moon shape with a "flat top", in the bottom area of the lens. The trifocal lens has three viewing areas, and the magnification area has two viewing areas, one for reading and one for intermediate distance. The standard CR39, flat top 28 trifocal has a reading area that is 28mm wide at the top. This is a good choice for prescriptions up to +/-3.00 sphere; above that, we would recommend a higher index lens in order to reduce the thickness and weight of the lens. This lens is available in the following range: -6.00 to +3.00 sphere, -4.00 to +3.00 cylinder, and up to +3.00 add (prism and slab off excluded). Plastic Tri-focal lens with transition feature in Brown or Grey. Reading area is 28mm wide by 7mm tall in a half moon shape. Read More Standard plastic CR39 lenses for trifocal vision distance viewing also include Transitions technology, so the lenses will turn dark outside and light inside. "Trifocal" means that the reading area has a half moon shape with a "flat top", in the bottom area of the lens. The trifocal lens has three viewing areas, and the magnification area has two viewing areas, one for reading and one for intermediate distance. The standard CR39, flat top 28 trifocal has a reading area that is 28mm wide at the top. This is a good choice for prescriptions up to +/-3.00 sphere; above that, we would recommend a higher index lens in order to reduce the thickness and weight of the lens. This lens is available in the following range: -5.00 to +4.00 sphere, -4.00 to +3.00 cylinder, and up to +3.00 add (prism and slab off excluded). The Executive Trifocal has two visible lines that go horizontally all the way across the lens, dividing the lens into three viewing areas. Three viewing areas with this lined tri-focal. Distance, mid-range and reading. Half moon 7*28mm viewing area with two lines. High index polycarbonate material is good for moderate to high corrections. Read More Crystal Vision polycarbonate lenses for trifocal vision distance viewing means that the reading area has a half moon shape with a "flat top", in the bottom area of the lens. The trifocal lens has three viewing areas, and the magnification area has two viewing areas, one for reading and one for intermediate distance. The standard polycarbonate, flat top 28 trifocal has a reading area that is 28mm wide at the top. This is a good choice for prescriptions over +/-3.00 sphere; below that, we would recommend the standard plastic lens. This lens is available in the following range: -9.00 to +5.00 sphere, -4.00 to +3.00 cylinder, and up to +3.00 add (prism and slab off excluded). Crystal Vision glass trifocal with half-moon shaped reading area that has an intermediate and up close focal areas. PLEASE ALLOW 2-3 WEEKS FOR PROCESSING GLASS LENSES. There are no warranties available on glass lenses. Read More Crystal Vision glass lenses for trifocal vision distance viewing means that the reading area has a half moon shape with a "flat top", in the bottom area of the lens. The glass trifocal lens has three viewing areas, and the magnification area has two viewing areas, one for reading and one for intermediate distance. The glass flat top 28 trifocal has a reading area that is 28mm wide at the top. This lens is available in the following range: -6.00 to +3.00 sphere, -4.00 to +3.00 cylinder, and up to +3.00 add (prism and slab off excluded). If your RX falls withing the "Stock" range and each lens is 52mm wide or smaller, you have access to this great lens package. Two year anti-scratch warrantee. Read More If your prescription falls inside this range ( -4.00 to +3.00 sphere, and -2.00 to 0.00 cylinder, no prism or slab) and each lenses is no more than 52mm wide, you qualify for this lens package. Please note this lens is not available with some frames or RXs, you will be contacted if your choice is not compatible. Crizal Avance, by Essilor, the world's largest lens company, combines excellent smudge resistance with superior dust repellence, thanks to new i-Technology ™, while maintaining glare reduction and scratch resistance excellence. And, these lenses come with a two year anti-scratch warrantee. If they scratch, you can send them back to us and we will redo them (in the same prescription and same frame only) at no charge! Nowadays, more people read from devices than from books. The average distance for computer devices is 24-30 inches - significantly longer than for books which are at 16-22 inches. The Anti-Fatigue lens has a +.60 correction at the bottom part of the lens, a sort of boost zone, which helps your eyes focusing more easily, and assist in eye strain. Zeiss is the world's pre-eminent brand of precision optics. If you are looking for the best, look no further than Zeiss. The Zeiss 1.67 index lens is a great choice for corrections up to +/-9.00. Read More The Zeiss 1.67 high index lens incorporates all of the history and technological perfection inherent in all Zeiss products. This particular lens is available in a range up to +/-8.00 sphere or +/-4.00 cylinder (prism and slab off excluded); for higher prescriptions, additional charges may apply. Zeiss is the worldwide leader in excellence in optical lenses. Founded as a workshop for precision mechanics and optics in the German city of Jena in 1846, the Carl Zeiss Group of today is a global leader in the optical and optoelectronic industries. There are currently more than 24,000 employees in the Group. The Group is represented in more than 30 countries by more than 50 sales companies. The company’s production centers are located in Europe, North America, Central America and Asia. Carl Zeiss is headquartered in Oberkochen, Germany. Carl Zeiss AG is fully owned by the Carl-Zeiss-Stiftung (Carl Zeiss Foundation). Carl Zeiss offers innovative solutions for the future-oriented markets of Medical and Research Solutions, Industrial Solutions, Eye Care and Lifestyle Products. The company develops and distributes surgical microscopes, diagnostic systems for ophthalmology, microscopes, lithography optics, industrial measuring technology, eyeglass lenses, planetarium technology, optronic products, camera and cine lenses, as well as binoculars and spotting scopes. Edge Polishing $19 Edge polishing is usually just for rimless frames. Read More All of our lenses are buffed at no charge. Edge polishing give a high sheen to the edges of the lens, which some people prefer on the lenses used in rimless eyeglass frames. In some cases people have lenses that are substantially thicker than the frame and they prefer to have a polish on the edges. Edge Rolling $29 Rolled lenses have the edges removed. Read More By removing the edges the lens appears thinner. Flash Mirror Coating $79 Flash Mirror coating is a half mirror, so people can still see your eyes. It is fashionable, and it also cuts glare. Available in silver, gold or blue - write down your choice at checkout in the order comments box. Read More Flash Mirror coating is a half mirror, so people can still see your eyes. Available in silver, gold or blue, flash mirror coating is both a fashion choice and a functional choice. The flash mirror helps to reduce glare coming off snow, water, and other shiny surfaces. By reducing glare, you reduce eye strain and eye fatigue, which leads to better long-lasting comfort in glaring circumstances. Flash mirror cannot be applied on top of anti-reflective coating. Follow this link to download a color chart of the available mirror coatings. High Cylinder Fee (Over +/- 2.00) $29 If the cylinder is over +/-2.00, stock lenses cannot be used. Only custom surfaced lenses may be used. Lens Swap Fee $9 Switching lenses to new frame. Read More If you purchase a new frame from us, we can switch lenses from another frame into the new frame. This is a non-refundable fee. New Nose Pads $6 Replacement nose pads, installed on your frame. Read More New nose pads replaced on your frame. Prism Fee $29 If your prescription includes a prism, your lens must be made as a "surfaced" custom made lens, and so there is an additional fee. Read More If your prescription includes a prism, your lens must be made as a "surfaced" custom made lens, and so there is an additional fee. Rimless Mounting Fee $39 Rimless, three-piece frames require careful drilling and mounting of lenses. Read More Some frames like the Silhouette rimless eyeglass frames have a double-drilled hole on each side of each lens. This work is done by hand by skilled technicians that do hundreds of mountings each week. This is a non-refundable fee. Rimless Temple Install Fee $19 Installing a new temple on a rimless eyeglass frame. Read More If you break one of the temples of your rimless, 3-piece eyeglass frame, we can install the new temple for an additional fee. This is work that is done by hand carefully, so as to preserve the alignment of the lenses in front of your eyes. This is a non-refundable fee. Follow this link to read an article about rimless eyeglass frames. Rush/Special Attention $9 Rush service guarantees that we will take special care to move your lens order as fast as possible. Read More Need your glasses as fast as possible? With our RUSH service, we will take special care of your order to make sure it is processed as fast as humanly possible. However, we will never compromise quality to make your lenses faster. Solid Mirror Coating $98 Solid Mirror coating is a full mirror, so people cannot see your eyes. It is fashionable, and it also cuts glare. Available in silver, gold or blue - write down your choice at checkout in the order comments box. Read More Full Mirror coating is a full mirror, so people cannot see your eyes. In fact, people can see themselves perfectly in your mirror lenses and they cannot tell where you are looking. Available in silver, gold or blue, full mirror coating is both a fashion choice and a functional choice. The flash mirror helps to reduce glare coming off snow, water, and other shiny surfaces. By reducing glare, you reduce eye strain and eye fatigue, which leads to better long-lasting comfort in glaring circumstances. 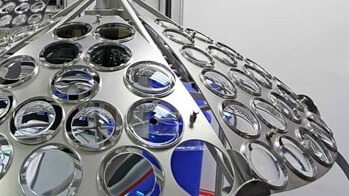 Full mirror cannot be applied on top of anti-reflective coating. Follow this link to download a color chart of the available mirror coatings. STEP 1: Get your prescription and pupil distance measurement. STEP 2: Choose a lens type. STEP 3: Choose a lens material. STEP 4: Choose a lens model. You are the best person to judge your own needs, your own habits, and your own budget. Even though every lens is made custom just for you by a highly trained technician, there are several choices that you can- and should - make. If you do not want to take the time to learn about prescription glasses, the easiest thing to do is to call us. You can describe what you want and we will tell you what options you have. And we will never sell you something you don’t need. After you get your prescription and PD measurement, go to the Lens Wizard. Following each step, the Lens Wizard pulls you through the process of selecting a lens by first getting some information from you about the frame you want to use, and your prescription. Then, the Lens Wizard gives you options that you can read about and then choose. This whole process can take as little as five minutes or as long as you want it to. The lens type you choose is determined by your lifestyle and your needs. It is not determined by your doctor, although a doctor can help you make your decision. If you need your glasses only for distance vision, or only for reading, then single vision lenses are the best choice. If your prescription has a reading addition AND you want your lenses for both distance and reading/computer vision, then you want multifocal lenses: progressive, bifocal, or trifocal. We offer just about all eyeglass lens types, but here is a list of the types of eyeglass lenses we offer: Single vision, progressive, bifocal, trifocal, reading glasses lenses, computer glasses, prescription sunglasses, fashion tinted lenses, polarized lenses, sun-sensitive “Transitions” lenses, and non-prescription lenses. Your prescription and needs will limit the eyeglass lens brands that are available to you. Once you have determined the type of lens that you want, you must choose a lens material. In general, if your prescription is below +/-4.00, then CR39 plastic lenses are good for you. If your prescription is above that, you should look for a higher index lens such as polycarbonate 1.59 index, or higher. Polycarbonate lenses are also recommended for children and sporting adults, in order to provide additional eye protection. Also, if your eyeglass frames have a rimless design, you should choose Trivex material which is strong enough to resist cracking, crazing, and chipping. In each category, we usually offer three choices – good, better, and best. As you go up in price, you get a better lens with more features. We offer every option you can think of for eyeglass lenses. For example: we provide free scratch resistant coating on all lenses; anti-reflective coating (AR coating), 100% ultra-violet protection (UV protection), Crizal no glare coating, tinting (any color), fashion tint (any color), double gradient tint (any color) flash mirror coating, mirror coating, edge polishing, and more. In the past, eyeglass lenses had always been made with glass. With the advent of high quality plastics in the last 20 years, glass lenses have been replaced almost completely with plastic lenses. Glass lenses have a slightly better optical clarity than plastic lenses and do not scratch as easily. However, glass lenses can shatter and cause serious eye injury. We do offer glass eyeglass lenses, but you need to allow 2-3 weeks for fabrication, and there is no warrantee against cracking or chipping. Are Cheap, Low Quality Lenses Bad for Me? Bad lenses leave you with bad vision. If you cannot see properly, you are hurting your productivity, causing additional eye strain, and you are missing details in the landscape which could harm you. Lenses are an essential tool in your daily life, and are well worth paying for the best quality you can get. Can I Order Replacement Lenses for my Frames? Yes, you can order replacement lenses for your frames using our Replacement Lens Service. After you place the order, you will receive a free shipping label, Then you simply mail you glasses to us and we will install the lenses. Can I Hurt My Eyes with the Wrong Lenses? There is no clinical evidence to suggest that looking through lenses with the wrong prescription or pupillary distance configuration can cause damage to your eyes. However, there could be other undesirable consequences (especially for people with stronger corrections), such as headache, dizziness, double vision, and vertigo. Some of these effects could cause a dangerous situation if you are driving, handling machinery, or otherwise reliant on your eyeglasses for your safety or the safety of others. You may experience some of these effects with a new pair of prescription eyeglasses, or a new prescription. The effects could fade over time, but we strongly suggest that you visit your local optical professional in order to determine the best course of action. Can I Buy Prescription Lenses From One Store, and Have Them Installed Elsewhere? It is highly discouraged. Prescription eyewear lenses cannot be separated from lens installation. Lenses must be purchased and installed by the same company. However, it is possible to buy prescription frames from one store and have the prescription glasses lenses installed at a different store. My Frames Are Broken, But My Lenses Are Still Good? Can I Re-use Them? Prescription glasses lenses can often be re-cut to fit new prescription frames, but there are some restrictions. The new prescription frame must either be the exact same frame model and size as the broken frame, or it must be smaller in every dimension (height and width). We do have a “Replacement Frame” service. Send a description of the frame and the problem to customerservice@eyeglasses.com, gives us a couple days, and we will get back to you with some options. Does It Matter Which Lens Brand I Choose? Your choice of prescription lens brand is a personal decision, which is generally a tradeoff between price and quality. In general, better quality brand merchandise is more expensive. In prescription lenses, a more expensive lens usually means a better quality lens, or a lens with a wider viewing area (in the case of progressive lenses). In some cases however, it may be difficult or impossible for a consumer to notice the difference between a high quality prescription lens and a low quality lens. 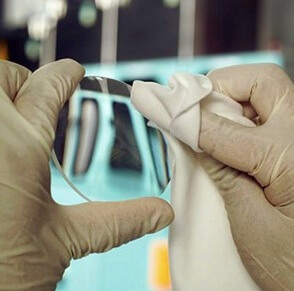 Anti-reflective and scratch-resistance coatings typically adhere better to the lens if they are applied by the lens manufacturer than if it is applied by a lens laboratory. Do You Sell Prescription Safety Glasses? No, we do not sell safety glasses at Eyeglasses.com. There are many different types of safety lenses and eyeglass frames depending on your job or your activity. Safety glasses should only be dispensed in consultation with your eye doctor and local optical professionals. How Do I Buy Childrens Glasses? We offer a selection of prescription glasses for children. The best way to begin fitting your child for prescription glasses is to get the child's PD measurement. When you have it, you should call our customer service department and discuss the needs of your child, and we can either find the perfect prescription glasses for your child or refer you elsewhere. How Do I Order Prescription Sunglasses? You can build prescription sunglasses the same way as prescription glasses. Begin by selecting a pair of eyeglass frames or sunglass frames that can hold a prescription. Lower quality sunglass frames are not designed to hold a prescription lens, and are called non-Rx-able. Rx-able sunglasses are sunglass frames that can accept a prescription lens. Most lenses are plastic (glass is still available, but heavier and more expensive), but the least expensive plastic used for eyeglass lenses is called CR39 hard resin lenses. Hard resin lenses are good for everyday use. These lenses have the least distortion of any non-glass lens. For children or active adults engaged in sporting activities, we strongly recommend polycarbonate (impact resistant) lenses. If the sphere on your prescription is higher than +/-3.00, you will benefit from the selection of a high index lens type. If the sphere on your prescription is higher than +/-4.00, we recommend a thin lens type. Thinner lenses have three advantages: they do not look thick, they do not magnify or minify your eyes when seen by others, and they are lighter. Polycarbonate lens material is the best choice for children, active adults, and sporting activities. Polycarbonate lenses are virtually shatterproof, provide the best eye protection of any lens, and includes 100% UV protection inherently. If the sphere on your prescription is +/-3.00 or higher, you should choose polycarbonate lenses. Polycarbonate lenses are very difficult lenses to tint and are not recommended for people who want custom dark sunglass lenses (we suggest Trivex lenses in this case). The suggested prescription range for polycarbonate lenses is plano (0, no Rx) to +/-6.00 sphere. Trivex is a relatively new plastic lens material that is being used as a substitute for polycarbonate lenses. Trivex is optically superior to polycarbonate and it is lighter. Like polycarbonate it provides 100% UV protection and it is extremely durable. Most importantly, Trivex is a great substitute for polycarbonate lenses that need to be tinted, because Trivex can be easily tinted but polycarbonate cannot. Trivex is much better suited for tinting and is an excellent choice for rimless drill mounted frames. The suggested prescription range is Plano (0, no Rx) to +/-8.00 sphere. Trivex may be slightly thicker than polycarbonate lenses, but due to its specific gravity the weight will be similar. High index lenses with 1.60 high index are good for people with prescriptions over +/-4.00 sphere, because they are thinner and lighter. Thinner lenses have three advantages: they do not look thick, they do not magnify or minify your eyes when seen by others, and they are lighter. The suggested prescription range is +/-4.00 to +/-8.00 sphere. Thinner, lighter and more expensive than mid-high index or hard resin lenses, high index lenses are a good choice for every day use. High index eyeglass lenses refer to one of several different kinds of plastic lens material. Eyeglass lenses all have a definite "index", which ranges from 1.56 to 1.74. For strong prescription, the higher the index, the thinner the lens; for weak prescriptions, a low index lens will be no thicker than high index eyeglass lenses. As a result, if you are looking for the "thinnest eyeglass lenses" for your prescription, read more so you do not pay extra money for lenses that are not thinner. Most people are looking for the thinnest eyeglass lenses, but "thinnest eyeglass lenses" differs from prescription to prescription. High index lenses with 1.67 high index are good for people with prescriptions over +/-6.00 sphere, because they are thinner and lighter. Thinner lenses have three advantages: they do not look thick, they do not magnify or minify your eyes when seen by others, and they are lighter. The suggested prescription range is +/-6.00 to +/-8.00 sphere. Thinner, lighter and more expensive than mid-high index or hard resin lenses, high index lenses are a good choice for every day use. High index lenses with 1.70 high index and 1.74 are the thinnest lenses on the market, and are made only for people with the highest prescriptions. If your prescription is lower than +/-6.00 sphere, there is no need for you to spend the extra money for an ultra high index lens. If you do have a strong prescription, however, the 1.70 and 1.74 high index lenses will be a good deal thinner than the 1.67 and 1.60 high index lenses; the higher your prescription, the thinner the lenses will be. The "Index" of Lenses is a term you will often hear, especially high index, mid index and low index eyeglass lenses. The “index” that is being referred to is the refractive index of a lens material. The higher the index number of a given lens material, the more the light will refract as it enters. If a lens material has a greater ability to refract light, less of a curve is required to obtain a specific power. Less curve results in a thinner eyeglass lens. Both the standard plastic CR-39, and glass are considered base or low index with an index of 1.498 for CR-39 plastic lenses and 1.52 for lenses made from glasses. When you see an eyeglasses lens index over 1.58 or greater it is considered high index. Progressive lenses were first introduced in the 1990's as a new lens product that offers multifocal vision "without the line". Lens companies realized that aging customers did not like other people seeing the visible bifocal line for cosmetic purposes. So the progressive "no-line" lens was invented, and marketed well under such names as Varilux Lens, Varilux Comfort, Varilux Definity, and Varilux Physio. This was great news for the eyewear industry because this lens was much more expensive than single vision or bifocal lenses, which meant more money for the companies selling them. Optometrists regularly "prescribe" progressive lenses to people, using their influence with patients as a trusted doctor to prescribe healthy aids. However, progressive lenses do not provide any physiological benefit to patients - only cosmetic benefits - but they do provide much more money to optometrists. Outside of the cosmetic benefits, progressive lenses offer the convenience of having distance and reading vision in one lens like a bifocal. Unlike a bifocal, however, the progressive lens also offer the mid-range and a continuous viewing area in the middle of the lens. On the negative side, progressive lenses have large areas in the patient's visual field that cannot be seen through, thus causing blind spots, and this can lead to headaches and nausea during the adaptation period (it takes time for a person to adapt his body and lifestyle to these types of lenses). Also, to use a progressive lens, the patient must learn not to move the eyes from side to side, but to move the head from side to side. At Eyeglasses.com, we urge patients to choose the right lens for their needs, desires, and pocketbook. In most cases, patients are more than capable of learning about eyeglasses, and making their own informed choices, along with advice from the eye doctor. Progressive lenses, which are sometimes called no-line bifocals, are actually trifocal lenses without the visible lines. Progressive lenses were developed because many people wanted the convenience of not having to change their glasses to read, but they did not like other people to see the visible line. Also, with progressive lenses there is a continuous transition from one viewing distance to the next,so there is no large jump from near to far as there is in bifocal lenses. If you need vision correction for both distance and reading, then can use two pairs of glasses, and alternate depending on what you need to see. Or, you can choose bifocal lenses, trifocal lenses, or progressive lenses (called multifocal lenses). Many people find it convenient not to be required to remove their glasses and switch to another pair in order to read something. Multifocal lenses divide the lens so that part of the lens is for reading and part of the lens is for distance vision. Bifocal (two areas) and trifocal (three areas) lenses have visible lines that separate the different areas of the lens. Progressive lenses offer the convenience of multifocals, but without the visible line. However, progressive lenses are much harder to use and to adapt to than bifocal or trifocal prescription glasses, and they are much more expensive. In order to create a no-line progressive lens, there are two large areas of the lens that you cannot see through. Imagine what an hourglass looks like. This is the shape of the area of the progressive lens that you can see through. Objects seen through the areas of the lens to the left and right of the narrow middle section are highly distorted and you cannot see through them. The bulge areas at the bottom and top of the lens are for near and distance vision, and the thinner corridor connecting them is for intermediate distances. On either side of the narrow portion of the hourglass objects will appear blurry. In general, more expensive progressive lenses like Varilux lens have a wider corridor, and less expensive lenses have a narrower corridor that can restrict the viewing area considerably. On smaller lens sizes, it is necessary to slice off a portion of the bottom (reading section) of the lens in order to install the lens in the frame. As a result, the smaller the frame size, the smaller will be the reading portion of the lens. In order to use a progressive lens, you must learn to move your head to see things; you cannot just move your eyes because you will be looking through a blurry part of the lens. This is called adapting to the lens. Most people can adapt within a month, but some people never adapt. It is common to experience dizziness and headaches during the time that you are adapting. Getting accustomed to progressive prescription glasses can be difficult, and you must have proper instruction by an eyecare professional. Sometimes, people who try progressive prescription lenses for the first time have a difficult time learning to look through the appropriate portion of the lens at the right time. Often a simple fitting adjustment to your prescription eyewear by your local optical professional can make all the difference. To fit progressive lenses (and any multifocal lenses) properly, the eyeglass frames must first be fit and adjusted to your face. At this point, an optical professional measures the segment height of your lenses. He makes two dots on the lens, one at the bottom edge of your pupil, and the other at the intersection of the lower eyelid and your eye. The measurement in millimeters from the bottom of the lens up to each dot is the segment height. To make any multifocal lens, we must have an accurate segment height measurement. If you send us a pair of glasses with multifocal lenses in them, we can read the lens and determine the seg height and make a perfect copy (replacement lenses for your glasses). But that segment height is specific to each pair of eyeglass frames and cannot be used for a different pair of frames. You can ask your local optical professional to measure the seg height for a pair of eyeglasses, and then send them to us with the markings on them. We can then make multifocal lenses. Or follow this link to learn How to Measure Your Segment Height. If you want to buy new eyeglasses or sunglasses with progressive lenses, or if you want to send us glasses without progressive lenses in them already, Eyeglasses.com can supply you with a progressive lens using our MFS (Multifocal Fitting System). Our MFS is a system that estimates how to mount the lens so that it will work for you. As a result, our MFS is not as accurate a fitting system as you would receive from a local optical professional. For some people, our MFS is not a good service, but you can still buy eyeglass frames at Eyeglasses.com and have the lenses installed by a local optical store. There is only one major restriction on the kind of frame that will accommodate progressive lenses. The eyeglass frame needs to have a height of 30mm or more. Height is referred to as the B measurement of the frame, and is the inside measurement from the bottom to the top of the lens aperture in the frame. If you have fallen in love with a frame that has a B measurement of 27mm to 29mm, there are some new short corridor lens choices that may work for you. Contact Eyeglasses.com customer service for more information. Bifocal lenses have a visible line in the middle of the lens, and the bottom part of the lens is the area your eyes look through when reading. Bifocal lenses have been around for decades. Until the introduction of progressive lenses in the 1990’s. bifocal lenses were used by everyone that wanted the convenience of near and far vision correction in the same pair of eyeglasses. If you need vision correction for both distance and reading, then you can use two pairs of glasses, and alternate depending on what you need to see. Or, you can choose bifocal lenses, trifocal lenses, or progressive lenses (called multifocal lenses). Many people find it convenient not to be required to remove their glasses and switch to another pair in order to read something. Multifocal lenses divide the lens so that part of the lens is for reading and part of the lens is for distance vision. The bifocal lens (two areas) and trifocal (three areas) lenses have visible lines that separate the different areas of the lens. Bifocal lenses are typically made in the Flat Top 28 style, but we also offer the upgrade lens options to the Flat Top 35 and Executive Bifocal or Franklin Bifocal Styles. There is only one major restriction on the kind of frame that will accommodate bifocal lenses. The eyeglass frame needs to have a height of 28mm or more. Height is referred to as the “B” measurement of the frame, and is the inside measurement from the bottom to the top of the lens aperture in the frame. If you have fallen in love with a frame that has a B measurement of 27mm to 29mm, there are some new short corridor bifocal lens choices that may work for you. Contact Eyeglasses.com customer service for more information. The Varilux lens brand is the brainchild of Essilor, the world's largest eyewear company. Varilux is the parent brand of a number of children brands, including Comfort®, Definity®, Physio® , Ellipse®, and others. Crizal is a sibling to Varilux, also created by Essilor. Varilux lenses are the clearest, widest-corridor progressive lenses available on the market today. With Varilux lenses, you can be sure that you have the best lens technology working for you. At Eyeglasses.com, most of the lenses we dispense are made by Essilor, unless a customer specially requests a different brand. Since 1959, with the invention of the world's first progressives, Varilux has innovated lens science to advance and set new standards of performance for vision and vision care for presbyopic patients. A combination of two good things, technology and innovation, Varilux progressive lenses provide clear vision at all distances without the age-old and unsightly bifocal lines. And with more than 300 million lenses sold worldwide, Varilux is the progressive lens brand that eye care professionals trust and recommend most. Varilux lenses are specifically designed for people over 40 who experience presbyopia - a condition in which near vision (needed when reading, sewing or working at the computer) becomes increasingly blurred with age. Varilux enables people to see near, far and everything in-between and look fabulous at the same time. Choosing the best progressive lenses for your needs from among Varilux family is partly a function of what you can afford to spend, and partly determined by your needs. The Varilux Physio® and Varilux Definity® have a 30% wider viewing area in the middle (corridor) which means you don't have to turn your head as much, and so it is more comfortable. If you have worn Varilux Comfort® lenses for years since they were first introduced, you will love Varilux Physio® and Varilux Definity® . The next question is, how to choose between the Varilux Physio® , Varilux Physio®360, and Varilux Definity® .This is more of a question for your eyecare professional, or the counselors at Eyeglasses.com. While we offer all of these lenses, they are often interchangeable for most people and there is little difference. What makes the best progressive lenses? In our opinion, the best progressive lenses are the progressive lenses that have the best optical clarity, and the widest corridor (the viewing area in the middle of the lens). With the widest corridor of any progressive lens on the market, Varilux Definity® and Varilux Physio® lenses are the easiest and most comfortable lenses to wear. Eyeglasses.com has an excellent service to replace the progressive lenses in your glasses with new progressive lenses with the same or a new prescription. Replacing progressive lenses is simple to do: you send us your glasses, we copy the measurements from the lenses and make new lenses. Introduced in 1993, the Varilux Comfort® is a line of progressive lenses that established a new standard on the market at the time of its launch. With its high performance and ease of adaptation, it received the acclaim of the optical industry. The concept of the Varilux Comfort® lens is the result of optical research and the use of what is considered a first in studies on the inner workings of the visual system. Thanks to a smooth adjustment process, the Varilux Comfort® line provides natural vision, whatever the distance. Observations on the wearer's visual behavior are at the origin of the creation this progressive lens. It complements the wearer's visual ergonomics, enabling the wearer to maintain a natural posture for ultimate visual comfort. Therefore, the adjustment to the lenses is much easier. Varilux Physio® lenses were introduced in 2006 and they benefit from innovative technology derived from spatial optics research to provide correction of presbyopia and other visual deficiencies. These progressive lenses guarantee a high-resolution vision, whatever the distance: - In distant vision, visual acuity is at its maximum: images are very clear and contrast is rendered perfectly. - In intermediate vision, the field of vision is widened by 30%. In this zone, where presbyopia is complicated to correct, focusing is considerably easier. - In near vision, Varilux Physio® enlarges the close-up zones of vision without requiring any change in posture. Created with the eye's physiology in mind, Varilux Physio® leads to perfect natural vision, whatever the activity being undertaken. Contrasts are improved. Varilux Physio® offers a personalised solution: correction of presbyopia which is precisely adjusted to visual behaviour. Definity® progressive lenses were created and developed by Johnson & Johnson, who later sold it to Essilor. Definity® progressive lenses are the only progressive lens that utilizes DUAL ADD® Technology, a patented, dual-surface, offset design which provides several distinct optical advantages, and a wider intermediate zone. Definity® lenses also offer the least amount of peripheral distortion of any progressive and a unique zone of correction called GROUND VIEW ADVANTAGE™, which features a reduction in power which minimizes distortion and flattens the field of vision, giving wearers greater clarity when looking down. Another significant benefit of DUAL ADD® and GROUND VIEW ADVANTAGE® is that these advantages become more pronounced as add power increases. As a result, Definity® remains the right solution for presbyopes as they age. Definity® is the perfect lens for the active lifestyles of today's presbyopes. With the superior intermediate vision, Definity® makes computer use, driving or any other everyday activity more comfortable. With clearer vision when looking down, Definity® makes going up and down stairs, playing golf or tennis, or navigating uneven surfaces easier. Anti-reflective coating (aka, no-glare, AR) is a series of layers that is adhered to the back and front surface of a lens, or just the back of the lens if the lens is polarized. The purpose of no glare coating is to help reduce the amount of reflections on the lens. Consisting of metal oxides, each layer is a thin film that is designed to block a specific wavelength of light. The more layers of film, the more wavelengths that are blocked. AR coating causes the light that reflects from the inner and outer surfaces of each film layer to become equal, thereby canceling each other out. Do you remember back in the 1990's when anti-reflective AR coatings regularly flaked, stained, and got psychedelic colors? It was a nightmare for opticians because customers got angry and would blame them for selling an expensive coating that did not perform well. Well, the clock has turned and anti-reflective AR coating is now completely reliable, whether you choose the more expensive Crizal AR coating, or the less expensive AR coatings that are available. Yes, if you leave your glasses on the dashboard of your car in Florida, the anti-reflective AR coating could show signs of stress, but this falls in the category of abuse. Anti-reflective AR coating does cost an additional $20 to $90 depending on the lens it is coating, but there are significant benefits to anti-reflective AR coating. Whether it is right for you - if it is worth the extra cost - is your decision. Your glasses will work fine without AR coating, but the relaxation to your eyes and improved vision may be worth it. Workplace - Fluorescent lighting, computer screens, cash registers etc. all cause an increase of reflections in the workplace. This increase in reflections causes eye straing, headaches, fatigue and a decrease in work productivity. Night Driving - External reflections are a major problem when it comes to driving safely at night. The reflections from oncoming headlights, streetlamps, and the road can cause distractions and discomfort to the driver. Internal reflections can cause ghost images and result in a decrease in reaction time. Sunglasses - Anti-reflective AR coating on the back side of sunglass lenses eliminate some problems. First is the annoying image of the eye that is reflected in the center of the lens and can be very distracting. Second is the glare hazard that is caused by the mirror effect of a dark lens. With sunglass lenses, light from behind the wearer can be reflected directly into the eye from the back of the lens surface, causing discomfort. Cosmetic - Without anti-reflective AR coating, reflections on the lenses will prevent people from seeing your eyes. Actors, newscasters, and businessmen prefer AR so that their audience and associates can clearly see their eyes. Eyeglasses.com offers three basic types of coatings. On our least expensive lenses and within a restricted prescription range, anti-reflective AR coatings are an extra $20. This is possible because the lenses are coated in a mass production of tens of thousands of lenses. On other lenses that are custom made, we offer a $59 anti-reflective AR coating which is an excellent coating. However, it is not quite as good at the premium Crizal AR coatings offered by Essilor. Anti-reflective AR coatings always work better when they are made by the same maker as the lens itself. For example, Zeiss AR coatingworks best on Zeiss lenses, Pentax AR coating works best on Pentax lenses, and Crizal AR coatings work best on Essilor and Varilux lenses. The reason for this is that the manufacturers each have their own formula for the underlying lens. That formula bonds best to an anti-reflective AR coating that is of the same chemical family. Premium anti-reflective AR coatings are actually bonded to the lens surface, becoming one with the lens. Crizal is the best known anti-reflective (AR) coating on the market, and also the best and the most expensive. Before you choose Crizal, think carefully about whether you even need or want anti-reflective coating on your glasses. Anti-reflective AR coating is chosen by 28.5% of eyewear shoppers in the United States, compared to 50-90% in Europe. There are many reasons that could contribute to this gap, but the primary reason is probably the bad history that anti-reflective AR coating had in its early years. In the 80's and 90's, anti-reflective AR coatings had a single layer which would craze, scratch or smudge easily. Today's AR coatings includes a harder layer of scratch resistant coating, in addition to oleophobic (anti-oil), hydrophobic (anti-liquid), and anti-static layers. These extra layers help to repel the things that lead to smudging and scratching. They also help to make the lenses easier to clean and thereby reduce surface scratches from excessive cleaning. Crizal® has become the industry standard term for a high quality lens coating. Made by Essilor, the world’s largest lens company, Crizal® sets the standard for durability and scratch resistance for eyeglass lens coatings. Essilor originally introduced Crizal® , but later that technology was superceded by Crizal® Alize®, and then Crizal® Avance™. Crizal® is not used much anymore, and it is almost always dispensed as Crizal® Alize® or Crizal® Avance™. Crizal is known for its “No Glare”/Anti-Reflective properties, but it also includes a super hard coating. Essilor is so confident about this super-hard coating that it provides a two-year, anti-scratch warrantee: If you scratch your lenses (in normal wear and tear), they will replace the lenses (same prescription) at no charge. Just send the glasses and the lenses back to Eyeglasses.com, and we will process it for you. is less expensive than Crizal® Avance™. Crizal® Alize® offers a double-sided integrated hardcoat, integrated multi-layer anti-reflective stack, super hydrophobic topcoat, and a pad control system. Crizal® Avance™ offers all of these, plus the anti-static technology of Scotchguard®. Crizal® Alize® offers superior scratch resistance, and also helps with glare and reflections during the day or at night. Crizal® Alize® is easy to clean and comfortable to wear. offers the best scratch resistance on the market. Crizal® Avance™ is the clearest and most cosmetically pleasing lens on the market. Not only is it the easiest lens to clean, but it stays clean longer than other lenses due to the anti-static properties of Scotchguard™. was introduced for sunglasses, because it provides a double-sided hardcoat, and the backside integrated multi-layer anti-reflective coating stack just like regular Crizal® lenses, but also includes tinting and mirror coatings. is a coating that combines anti-reflective technology with a unique formula that also block harmful blue light. Blue light harms the retina, and is among the risk factors for the onset of age-related macular degeneration. is the most recent introduction to the Crizal® family. Crizal® Sapphire™ offers the most advance UV protection, scratch protection, and anti-reflective protection on the market today. Crizal® Sapphire™ also features the best clean ability of any Crizal® coating, so any fingerprints, water and smudges wipe away with ease, and low-Maintenance! The best dust repellence so your lenses stay cleaner, longer. is the newest introduction to the Crizal® family by Essilor, the world's largest lens company. Crizal® Sun™ uses all the advantages of the Crizal® coatings, but adds high quality lens tinting and mirror coatings. To begin, backside anti-reflective coating virtually eliminates annoying glare and reflections. Add to that the dual-sided, fully integrated hard coat for unsurpassed durability and scratch resistance. Add to that a dual-sided, fully integrated super-hydrophobic layer for the most cleanable sun lens in the industry. Add to that a radiant mirrored front side combined with polarized properties offering premium clarity with 100% UV protection. And finally, at the core of the lens is full polarization to eliminate glaring jumping up from the ground, water, or road. With the Crizal® Sun™ lens, eye strain and fatigue are eliminated, offering maximum comfort. The patented Crizal® process preserves original lens color. The Crizal® Sun™ lens offers the best protection and the highest level of comfort from the best sun lens in the industry. Crizal® Sun™lenses are available in both CR-39, and Airwear (polycarbonate) materials, in the following lens types: Single Vision Bifocal flat top 28 (CR39 only) Varilux Comfort (CR39 only) Varilux Physio Varilux Physio 360 Definity Short Crizal® Sun™ lenses come with silver or blue mirror coating on grey lenses, or gold mirror on brown lenses. At Eyeglasses.com, we can quote you an ony lens, just give our customer service department a call. For more information, visit the website at Crizal® Sun™. Transitions® Photochromic lenses are lenses that darken when exposed to UV light, such as when you walk outdoors. When you are no longer exposed to the effects of UV, (i.e. walk indoors), the lenses return to their clear state. Transitions® lenses are a brand of lenses made by Essilor, the world’s largest lens company, and Transitions® photochromic lenses that block 100% of harmful UVA and UVB rays. Many people love the convenience of photochromic lenses, as they can have the convenience of both regular eyeglasses and sunglasses in just one pair of lenses. Do Transitions® Lenses Protect Against UV Rays? Do Transitions® Lenses Reduce Glare? Yes, they become dark light sunglasses when exposed to bright sunlight. If the light conditions are reduced (clouds, windshield, trees, etc), the tint level automaticall adjusts. Transitions® lenses automatically darken depending upon the amount of UV radiation present. The brighter the sun, the darker Transitions® lenses get, all the way to as dark as most sunglasses. So, they help enhance the quality of your vision by reducing the sun’s glare in different light conditions; on bright sunny days, on cloudy days and everything in between. However, since extremely high temperatures tend to affect lens performance, original Transitions® lenses may not always get as dark as sunglasses. Also, since they are activated by UV exposure, original Transitions® lenses don’t work behind the windshield of a car since your windshield actually blocks UV rays. As a solution to hot weather performance and behind the windshield activation, Transitions® launched Transitions® XTRActive™ lenses. These lenses are the darkest everyday photochromic lenses on the market. They offer superior darkness in all temperatures, thus delivering excellent sun protection for those who spend a lot of time outdoors. In addition, these lenses offer a slight tint indoors and activate moderately behind the windshield of a car. Photochromic lenses – such as Transitions® - contain a special dye that causes the lens to darken when exposed to ultraviolet sunlight rays. When the UV light diminishes, the lenses get clearer. However, the level of UV protection does not change – Transitions® lenses always provide 100% UV protection. Are Transitions® Lenses A Good Alternative To Clear Lenses? Yes. Photochromic and Transitions® lenses are as clear as clear lenses indoors, and as dark as most sunglasses outdoors in bright sunlight. As light conditions change, the lenses adjust quickly to provide the appropriate level of tint. Photochromic lenses are compatible with all frame styles, and are available in all types of lens materials and designs. How Fast Do Transitions® Lenses Work? Transitions® lenses begin to darken the moment they are exposed to UV light. The greater the intensity of UV radiation, the darker the lenses become. The moment UV rays are no longer present; the lenses begin to fade back. In short, Transitions® lenses quickly darken when you go outdoors, and fade back fast when you return indoors. Most wearers report the adjustment happens so smoothly that they are unaware of it. They are aware, however, of their continued visual comfort. Are Transitions® Lenses Suitable For Driving? Windshields in today’s vehicles block most of the UV rays that cause Transitions® lenses to activate, or darken. As a result, just like clear lenses, most Transitions® lenses do not activate inside a car. An exception is Transitions® XTRActive™ lenses which feature moderate activation behind the car’s windshield, improved darkness in hot outdoor conditions, and a slight indoor tint. Special-purpose driving lenses have been developed that combine polarized lens technology with Transitions® technology. These lenses carry the name Drivewear™. Are Transitions® Lenses Appropriate To Wear While Working at a Computer? Yes. They can be worn any place that you would wear regular, clear lenses all day, every day. Transitions® lenses help you see more comfortably inside and out, day and night. Are Transitions® Lenses Available In Different Lens Designs? Yes. Transitions® products are available for virtually every prescription, material and lens design. They are also available in shatter-resistant, standard and high index lens materials. Regardless of your prescription or lens preference, you may choose either gray or brown Transitions® lenses. Transitions® lenses are also compatible with lens treatments and options such as anti-reflective (AR) coating, scratch resistant coating and edge polish (which removes the frosted look from lens edges). Ultraviolet "UV" protection and UV coatings are an important consideration when buying eyeglass lenses. Most eyeglass lens materials already have 100% UV protection, and this list includes polycarbonate lenses, high index lenses, Trivex lenses, Transition lenses, and polarized lenses. Eyeglass lenses that do not have UV protection are the least expensive CR-39 lenses, and it is important to add a UV coating to these lenses, especially if the glasses will be worn outside. Most importantly, sunglass lenses that are CR-39 must also have UV protection in the form of UV coating and this is an FDA regulation. Cheap flea market sunglasses often do not have UV protection or UV coatings; this is most dangerous because the tint causes the pupils to dilate, and then the eyes admit more UV radiation. UV Protection and UV coatings in eyeglass lenses have come to the forefront recently, as Prevent Blindness America (PBA) has declared May 2009 as “UV Awareness Month” to help educate the public on how to protect their eyes. Ultraviolet rays are well known for their damaging effects on the skin, PBA points out, but exposure to UV rays can cause “sunburns” to the eye, also known as photokeratitis. The damaging effects of UV rays may not develop until years later. In fact, UV damage is cumulative and has been linked to cataracts and macular degeneration later in life. The delicate skin around the eye and the eyelids is also susceptible to UV damage. Many people routinely take precautions to protect their skin against UV rays but are unaware of the need to protect their eyes against UV damage. Research indicates that long-term, unprotected exposure to the sunlight can lead to age-related conditions such as macular degeneration, cataracts and other eye conditions that can compromise healthy sight. Most eye care professionals now recommend that people protect their eyes against UV exposure at all times. UV protection and UV coatings in eyeglasses and eyeglass lenses are strongly recommended. PBA notes that no matter what time of year it is or what the weather forecast is, sunglasses that block 100 percent of UV-A and UV-B rays should always be worn in conjunction with a brimmed hat. Wrap-around sunglasses are best as they protect the eyes and the skin around the eyes. Some contact lenses may offer UV protection but they can’t protect the entire eye and the skin around it. Essilor is the largest and highest quality eyeglass lens maker in the world, with over 200 lens labs in the United States alone. So when you ask Eyeglasses.com to make your lenses, you are not getting a local guy cutting lenses in the back room on aged equipment. You are getting the very best plastic (or glass) lens, installed in a quality controlled, ISO 9000 lens-making laboratory. Your lenses pass through 16-21 quality control stations before they are finally released. If the lenses fail at any one of those stations, they are returned for further processing, or they are scrapped and begun again. Essilor is the world leader in eyeglass lenses. Essilor created the first and finest progressive lenses (Varilux lenses, Varilux Definity®, Varilux Comfort®, Varilux Physio®, Varilux Ellipse®), the finest lens coating (Crizal), and the finest single vision lenses on the market today (Orma, Thin&Lite, and Airwear). But if none of these lenses appeal to you, we can also offer Zeiss, Transition, Younger, Trivex, Kodak, Pentax, Sola, Hoya, and other lens brands - just ask for a quote. To make perfect eyeglass lenses, getting the right lens is only half of the story. The other half is the lens installation. If you buy the best lens and it is installed wrong, you have wasted your money. At Eyeglasses.com, you can be assured that you are getting the exact lens you ask for, and it is being installed with the very highest skill, attention to detail, and quality control. Several groups are involved in the making of lens. A problem in any one of these steps can lead to less effective vision correction by the lens. A good provider of eyeglass lenses will have relationships with the best lens quality providers, but will also check and re-check every lens before dispensing it. The store you choose to make your lenses must insist on quality at every level in order for you to receive the best quality product. This kind of quality control is essential in order to ensure consistent results. 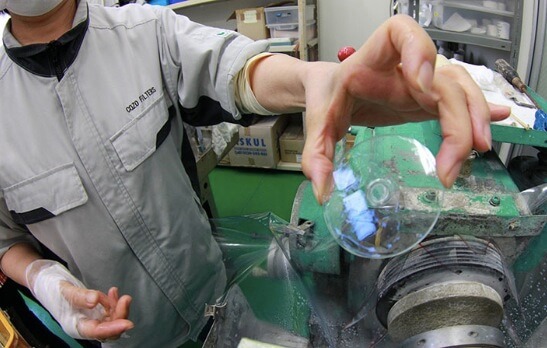 --The maker of the plastic determines the clarity of the plastic: Essilor, Zeiss, Pentax, Seiko, many others. --The cutter of the plastic determines the precision of the carving. The plastic maker does the surfacing for stock lenses. The lens laboratory does the carving for surfaced lenses. --The eye doctor determines the optics for the lens such that it will work best for your eyes' condition. An eyewear store employee measures the pupillary distance. --The person that cuts ("edges") the lens for your frame installs lenses so that the optical centers match the pupillary distance measurement. This could be an eyewear store employee, or lens laboratory. There are hundreds of lens laboratories around the country, several in each state. A typical lens laboratory will do a minimum of a few hundred lenses a day with a large staff of highly trained and experienced technicians. A few optical stores (like Lenscrafters) have small surfacing facilities in each of their stores doing much smaller lens volume. To surface a lens, the lens laboratory takes the blank and puts it through a series of grinding machines, which grinds the surface the lens and shapes it exactly to the specifications of the prescription. 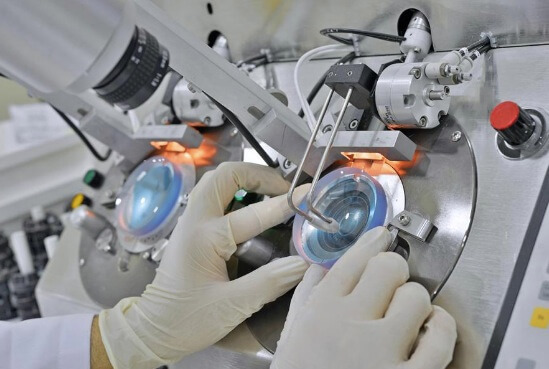 Lens laboratories also provide other services like edging and mounting, which optical stores can choose to use or not, depending on whether they want to do that work themselves. As with any custom service, the quality of the surfacing and any other services that the lab provides-- is determined by the experience and the expertise of the laboratory, its personnel, and the equipment it uses. We only use labs that employ a large staff of highly trained technicians, doing a large volume of lenses every day. At Eyeglasses.com, we do none our own edging services ourselves, and all of it is done by our lens laboratories. Most of our orders require stock lenses; all of our custom surfacing work is done by lens laboratories. 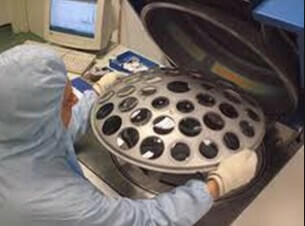 The laboratories that we use each have many years of experience and do thousands of lenses each week. Each lab that we use inspects each lens several times during the manufacturing process. When we receive the finished product from the lab, we do our own final inspection. Follow this link to learn a method for How To Measure Your PD. After the lenses have been made, they need to be installed in the eyeglass frame. They are then “Edged” or cut and formed to fit precisely into the frame. Edging is performed in a number of different ways. It can be done at the lens laboratory, or in the optical store. Either way, it is not required in any state that the edging be done by a licensed person. About one-half of the states in the United States have opticianry laws. In those licensed states, edging can be done by an unlicensed person that is "overseen" by a licensed person. The edging for most glasses made in this country is not performed by a licensed professional. However, all of the edging that is done for Eyeglasses.com is done in a state-of-the-art lens laboratory. When we ask our laboratory to do the edging, it is done by an employee/tradesman that does at least hundreds of jobs per day. That person has a very high skill and accuracy level that we have found to deliver very high quality. There are many different types of lenses, different prescriptions, and different frame types. To create a pair of custom eyeglasses, our lens lab must match your choice of lens type, prescription, and frame type. Eyeglasses.com has built in five levels of safety measures to make sure that the combination that you choose will result in a perfect pair of glasses. Our Lens Wizard is designed to catch many of the more common conflicts that can occur, but it may miss many of the more rare conflicts. For example, we cannot put a progressive lens into a frame with a "B" measurement (lens height) of less than 28mm, and so the Lens Wizard will prevent you from doing this. Also, if you want a rimless frame, the Lens Wizard will not allow you to choose a CR39 lens because it is not strong enough to handle the pressure of the drill mounting. Many orders to come through the Lens Wizard that still have problems, or we may have questions about the order. Either way, we will contact you before we begin working on your lenses, in order to describe the situation, and resolve the conflict. For example, some prescriptions are too high for CR39 lenses. It is technically possible to make the lenses, but they will be very thick. In this case, we will contact you, describe the problem, and discuss alternate solutions. Occasionally a lens order will make it all the way to our lab, and our trained lab technicians could find a problem. For example, on a high plus prescription and a large rimless frame, sometimes the edge might be too thin to be sturdy, and we will recommend a change. Or, you might want prescription lenses installed in a sunglasses frame with too much wrap. Either way, it requires a lab technician to spot the error, and again, we will not continue with your lens work until we have discussed the situation with you. If we do make glasses for you and there is a problem, we have a perfect lenses guarantee: If your lenses are not perfect, we will redo them or refund your money. Ordering prescription eyeglasses from Eyeglasses.com is completely safe, because we will not let you make a mistake if we can help it. We have built in five layers of research, analysis, and technical expertise for your personal prescription glasses order. STEP 1: Get a prescription. STEP 6: We will contact you when we receive your frame. If we have any questions or suggestions, we will contact you before we do any work on your lenses. STEP 7: We ship the completed eyeglasses back to you. Replacement lenses are available in standard plastic, polycarbonate, and hi-index plastic, and glass. It is good to remember that your eyewear lens material determines how well those lenses will perform in every day situations. In the past eyewear lenses were only made from glass. You can still buy replacement lenses made from glass. However they are substantially heavier and more expensive than plastic lenses. Glass lenses are optically clearer than plastic, and are extremely scratch resistant. However they are much less impact resistant than plastic glasses even though in accordance with FDA regulations, glass lenses are safety hardened. Standard plastic replacement lenses are the least expensive material from which eyewear lenses are made. However to provide the high optical quality of standard plastic lenses (CR-39), the result is the trade-off of offering less strength and reduced durability. Because of the reduced durability of plastic lenses, if not properly taken care of, they will become scratched resulting in a loss of some of their visual clarity. 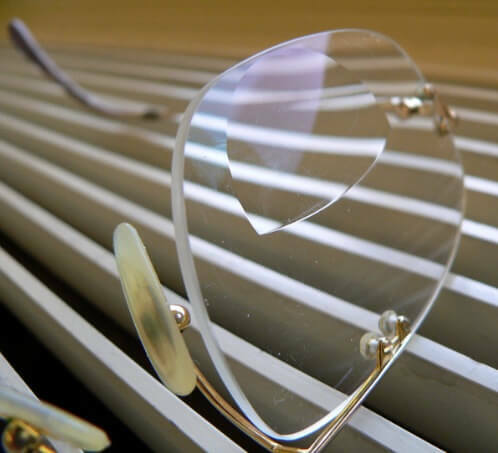 We recommend that plastic lenses have a scratch resistant coating applied to them to protect against such damage. There’s no reason to discard a perfectly good pair of sunglass frames just because you need to replace the lenses. If you have bought a fabulous pair of vintage sunglasses, which often come without lenses, we will add the lenses so when you hit the streets or the beach you will look as glamorous as the old time movie stars and celebrities. We offer various tint options for your sunglasses replacement lenses: regular sunglasses tints in various colors and densities, fashion tints in most fashion colors from a light density tint 15% to a dark density tint of 35% , and gradient tints. If you are unsure of what type of eyeglasses replacement lenses would be best for your frames and needs, give us a call. Choosing replacement lenses can appear complicated due to the numerous options available, but our knowledgeable customer service representatives are here to help. Prescriptions have a certain format that is always followed. The first line of your prescription is always for the right eye, sometimes designated the OD. The second line is for the left eye, sometimes designated OS. The prescription for each eye is divided into Sphere, Cylinder, and Axis values. It is common to have no values for any one of these, in which case you might see the letters PL or plano, or to have values for all of these. Sometimes the prescription may say OU which means both eyes. We strongly recommend that you fax your prescription to us. We can read your prescription and then help find the best prescription eye glasses lens for you. For multifocal lenses and progressive lenses orders, we require that you fax your prescription to us. If your prescription is for bifocals or trifocals of progressive lenses, there may be additional information on the prescription that says for example Add +2.50. This is important information if you are ordering reading or multifocal lenses. The numbers are expressed in diopters that tells the power of the lens. A diopter is a value that is metric and universal worldwide. On a prescription for multifocal glasses lenses, you will see information designated as add power. Your add power is simply the magnification that is added to your sphere value for distance vision, in order to create a field of view for reading. For example, if your sphere value for distance viewing is 3.00, and your add power is +2.00, then your near vision correction is 1.00. Or, if your sphere value for distance viewing is +1.00 and your add power is +2.00, then your near vision correction is +3.00.